Domaine de la Morderee, Lirac, 2006. I love this wine, and it never seems to disappoint, no matter the vintage. This was my first taste of the 2006 and it's juicy and berry delicious - juicy generally isn't a word I associate with Lirac. Most Lirac I've had is pretty austere and mean, except for the roses. So make a New Year's Resolution and drink good wine everyday. Cut out that Starbucks triple vanilla caramel frappucino and drink better wine. $21.99 at the Wine House. A little animally at first, but then it really opened up and lost the animal flavors to good strawberry and raspberry fruit. 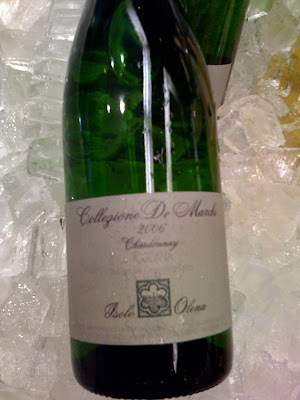 Lots of acidity, of course, and while a little rustic, I found it very pleasant and easy to drink. It also had some surprising cinnamon, Christmas spice qualities. We had this in the desert with lentil soup. Earthy and delicious. Cheap too! $19.99 at Rosso Wine Shop. PSA: It may be hazardous to your health. Though I like the advertisement, I did not find this wine particularly Bold and Robust... I actually found it oxidized, lean, fruitless and over the hill. I think this wine poisoned me actually, hence the headache and nausea the day after our dinner at Palate... I usually don't post on wines that don't do it for me, so let's just consider this a public service announcement. $15 on Wine Bid, courtesy of Julian of the Cheese Store of Silverlake. And I wonder why I felt sooo miserable the next day. Ok, the Prunotto, Barolo, $215 was really spectacular. Still had lots of fruit and I found it not be dead or overly oxidized, of course, can anyone back me up on that? The Hubert de Montille, Volnay, 1er Cru, 1997 ($60 something dollars?) I thought was very structured and still really youthful given its in half bottle and has 11 years of age on it. It had pretty good tannins and dark cherry fruit. The Georges Brunet, Vouvray was slightly sweet and very wooly. By the time we got to this I had no concept of price. The remainder of the wines to be posted tomorrow!! Try any of these at Palate!!! Kuhling-Gillot, Riesling, Oppenheimer Sacktrager, Kabinett, 2002. Really a classic vintage, and a beautiful delicate wine. Some light sweetness, but its very integrated, peachy and elegant. I love Riesling and this is the perfect time of year to indulge. You can get it as part of the tasting menu or BTG at Providence. $60 by the bottle. Check out the website - these people are way too good looking to be making wine! BUT you can't see their feet and for all we know they are wearing white knee socks with Birkenstocks. Pelerin, Les Tournesols, White Rhone Blend, Santa Lucia Highlands, 2007. 72% Roussanne, 19% Viognier, 9% Chard. I tasted this wine with Drew Langley, somm at Providence. Costs around $60 on the list I believe. I bought the Syrah from Cheese Store of SL over the summer and really liked it and thought the white was just as good if not better. These are the tasting notes from the winemaker, and I concur 100%. The 2007 "Les Tournesols" Roussanne blend offers an intriguing range of apple and asian pear aromas and flavors accented by subtle notes of jasmine, vanillin and roasted almonds. The texture is very finely balanced - with the focused and fruitful characters interwoven with the broader and richer notes - culminating in a distinctive and lasting finish reminiscent of fresh lime, honey and ginger. Only 243 cases made! We like that. Plus, the label is tres cool. It has the feel of a Jesus figure. An old one without shoes. I was baptised once. Didn't take. But this wine did. Foucault, Clos Rougeard, Saumur-Champigny, 2004. We loved this little Loire baby. It wasn't cheap for Saumur, but it had great texture and a combination of elegance and lots of great red fruit flavors. Great acidity. It definitely has Burgundian elements to it, in the silky texture. There is nothing green or unripe or weirdo Cabernet Francy about this wine. Straight up delish, intense and complex! Ok, the killer is it was $55 at the Wine House! For Saumur?? That's crazy! But it was so fun and exciting that it did not disappoint. We just saw it on Wine Searcher for $48 at K&L. So there you go... comparative shopping! I had a great Chinon from the Cheese Store of Silverlake that was much less expensive and I'm dying to blog on it, but I can't figure out what I did with the photo... to come as soon as I find it. Maybe I don't actually hate it. You know me, I really dislike Chablis generally. I know that makes me lame and unsophisticated, but alas, you have to call a spade a spade. This one, however, was another wine from the MW mock tasting last weekend, and I really liked it and you know what? I also identified it correctly! Maybe it was my ego, maybe the wine was actually good, whatever it was it made an impression. No oak, nice minerality, lots of lemon crispness and a little milky lactic flavor. 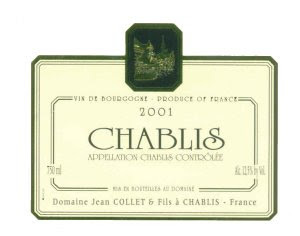 Chablis always smells like the inside of a cardboard milk carton to me, one that has soured a little. I mean that in the best way. This is $24.99 at the Wine House. 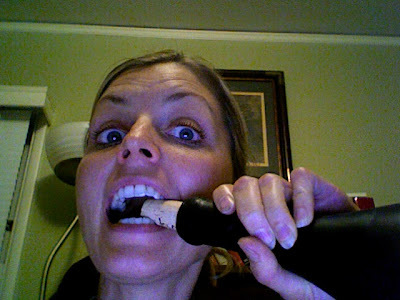 Hey guys, sorry for the delay in blogging I was in Sonoma for a mock tasting exam. I had a fabulous Champagne that I think if you've got a little cash to spend, you should! 60% Pinot Noir, 25% Chardonnay and 15% Pinot Meunier. It had terrific floral elements and earthiness thanks to the red grapes and the Chardonnay provided lemon, citrus and steely components. Super delish and its too bad that I had to spit it. It was the first wine in the flight so I had no choice!! And by the time the 2 hours and 15 minutes passed it was flat. How sad is that?? This is a true Luxury Champagne for a pretty cheap price. Another wine I can't find. 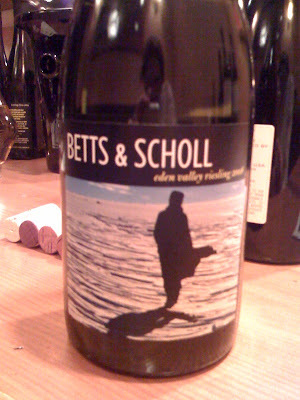 Betts & Scholl, Eden Valley, Riesling, 2008. Peter had this wine in Colorado and said, "It's Dry with lots of fresh fruit and acidity." He really liked it, but I must confess I haven't had it yet so I can't say much except that he's my hubby and I usually like the wines that he likes. But I don't know where you can get it? It should go on a wine list for around $60 and retail for $30... So I'd love to give it a try if someone can tell me where it is in LA. I do realize that's my job, but I can't do everything around here!! Bruno Rocca, Barbera d'Asti, 2006. Then when Peter said, NO, You're wrong and said tell me the characteristics of this wine and I said, High acid, low tannin, bright fruit with some rusticity - the light went off in my head and I said, Yes, ok - it's BARBERA. HELLO!! That's why structure in tasting matters - it actually works! Anyhoo... who cares about that. What I found to be interesting was that it was very smoky and spicy and when we went back and tasted it again Peter agreed that it did indeed taste Syrah-esque. Also there was some new oak on this - or seemed to be. It was actually an outstanding wine for the money. $25.99 at the Wine House. I know I've been writing about the wine house a lot lately. Peter went on a shopping spree there for blind tasting wines, but let me know if you know where else this wine can be found, especially in smaller retailers and restos. This isn't really wine in that it's made from apples, not grapes. Eric Bordelet, Sidre Doux, NV. Only 4% alcohol it's delicious and earthy and cidery - it says Doux - but wasn't perfect for drinking while decorating the tree. We actually had the Poire sparkling - from 100 year old pear trees - for our Christmas festivities. You can get both of thee at El Vino is Venice. Today is my 200th post! Yahoo!! I celebrate with 2006 Grilli di Testamatta. Sangiovese 80%, Canaiolo 10%, 10% Colorino. 92 points Wine Spectator: "There's beautiful fruit in this wine, with berry, chocolate, and Indian spices. Full bodied, with velvety tannins and a long, flavorful finish and although it has loads of fruit, it is refined and balanced." As for me, our friend Giacomo makes this wine and so I'm biased no matter what Wine Spectator says. I totally agree with the Indian Spices thing - that makes this wine really exotic, but I found it to be much lighter in body that WS. I mean, it's Sangiovese, not Cabernet. The tannins were soft and the fruit was pretty bright, not deep. I didn't find any chocolate either... oh well, what do I know?? My friend Kirk started his own LA wine blog and I'm psyched to have a partner out there!! He works the camera in casting offices around town and I dig him because he's like a real dude. I don't say that about most people I meet in my "other" life. Stop reading my blog, because its boring, and check out his blog! We drank this with the Turkey on T-Day and it was pretty good for $21.99 (Wine House) Despite the picture - it was COLD in Palm Springs and the dog escaped twice, which was really annoying! The wine was stewy and dark, almost like 2003, and paired well with cranberries and Durkee Green Bean Casserole, made from Campbell''s Cream of Mushroom in a can. How's that for a recommendation? How's that for American????!! In other news, I'm really bored with blogging about what I'm drinking. I mean, does anyone really care? Why blog? I love reading blogs because they provide me with news and view points on current events. What's the purpose of this blog? I show you the bottles that I consume as I stumble my way through life. How depressing. Thanks for joining me though. Misery loves company. Isole Olena, Chardonnay, Toscana, 2006 actually really good Italian Chard! This is the guy who makes Cepparello. A good one for Christmas or just for today. I've written about Lopez de Heredia, Rioja before but I didn't write about the 1981 that my friend ws nice enough to share with me at Palate. We drank this next to a 2003 Barolo and I much preferred this wine. It was so elegant and refined. Like silk pajamas, I wanted to curl up in it. The fruit was faded, but the wine was not oxidized. It had some dried fruit and nuts, but I found it to be alluring and not off putting. Some people love really old wine that tastes like dried out poo poo (1981 Sebastiani anyone?). I don't happen to be one of those people. But old wine that's well made and properly stored is a real treat. And this little bottle is just that! You can get this at Wine House, Wine Exchange, Wally's and K&L. all priced between $79.99 to $99.99. Make it a special Christmas treat!